I just a normal guy that was sold already when I was about 10 years old. I grow up on small places on the west coast of Norway. The normal training stuff there was running, cross country skiing, football, shooting, cycling, tennis and of course I did it all. My hope was to be a good long distance runner, but with my heavy bone stucture this would be a problem. But I tried for several years, and of course harder than many other people. At the same time I found some books in a catalog where you could learn Jeet Kune Do. Since I already had seen Bruce Lee movies, then this was books that I wanted to have. After I've got them I start training after them, but I didn't really know what I was doing. But my first test was af boxing fight with my a neibour that was 3 years older than me. He had boxing gloves, and he knew that another kid had a couple of boxing gloves. So I did a deal with this guy and he got a lot of cartoons from me. Then I was ready to start, and we went to the fotball ground. There was no rules, and I really hit im so many times that his sister stopped him. Then I know this was me, and I have never stopped. 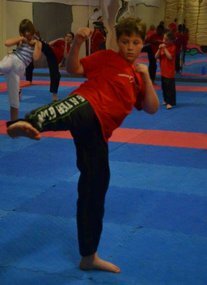 As I grow up and change places I started with karate, but the biggest opertunity was when I moved to Bergen and startet on the Enginering School. I found a couple of Karate Schools and trained there, but I stille missed the real action. There was nothing wrong withe Karate but I just wantet som more. So about in 1989 I saw a poster with Kickboxing, and my first thought is this something for me or not. I was alone and didn't know anyone there. But I decided to go, and it was a lot of people there. I don't know how many but the trainers was stricked like hell. If was really fun and the trainers was so good. Kickboxing was so different from Karate, but I decided to not stop the karate training. So I continued with both arts art. Now it's 25 years ago and I am still friends with my trainers, and of course I never stopped training Kickboxing. Thanks to Morten Saksvik and Bård Trones. They are still in the Kickboxing system. But the history doesn't stop there, because I am not a guy who is stopping searching for new stuff. I saw a poster close to the Enginering School. This was a new art and it was about Whing Chun with a guy called Armando Silva. My thought was Bruce Lee, and this is what I want to train, but I could not stop with the other arts. So here I go again, and new style again,.This was the time when I was young, and looking for action. He formed my way of thinking and I am very greatfull for that. In the years before I went in the army I trained a lot of other arts also, but since it was for shorter periods. Then I just keep it out. But Thai Boxing, Tai Chi and Ju Jutsu was som of the arts. Basically I trained at least 6 days a week and it was hard to manged to go from one trainng to another training at de same day. In 93-94 i went in to the army, and of course I was in good shape. After a month it was a selfdefence course with a captain that was a specialist in boxing and Ju Jutsu. I used my combination of all styles and after a couple of training hours the course was mine. I started a selfdefence course and trained a lot of sodiers in the army. It's nice to think about know. When I was finished in the army I moved to Oslo because I got a job there. But no art to train, and I didn't know where to train. I tried several clubs, but when I was downtown in the city I went by a studio runned by Wolfgang Wedde. This was a well known name in Kickboxing, and I also knew that he trained other arts. After meeting up there the first time I decided to stay. I" loved" the guy because he was hard like hell, but still understanding. He had always good explanations, and we always trained the body and mind. When he asked me to teach I could not say no, because I found out that this was a good way to develope myself.. 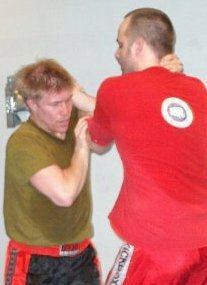 In 97 I got in contact With Leif Røbekk, and then I saw the opertunity to traine real self defence again close to the Whing Chun. Leif Røbekk that was a instructor in Jeet Kune Do, and he came to oslo. I decided to start a unit under him. This was heaven for me because a got knowlegde from two people. This combination was also the first time I started with seminars with Larry Hartsell. I kept doing both of them until 2002. When Wolfgang decided to sell the studio to Thomas Hansvold. I folowed him fra I year. 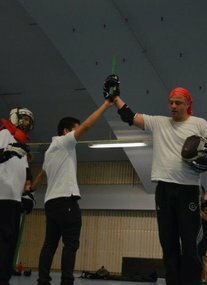 Then I started my own Club in JKD under Leif Røbekk and had kickboxing also. But in 2008 I closed the Club, because of my 2 kids. I still trained some kickboxing under Figther Kickboxing Club. This was a good club, and still one of the best clubs in the world. Thanks to the founder of the club. The name of the founder is Daimi Akin, and he is well known in the Kickboxing system. 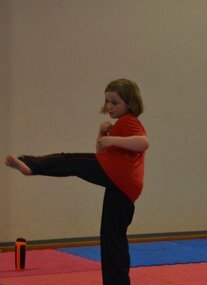 My kids is getting bigger and both of them are training kickboxing at Fighter, and me as one of their instructors. I also wanted to keep the selfdefence art so I startet for 1 1/2 year ago with Kalisikaran.I am finely back and learning new stuff again. The Kali Sikaran Club is a small club, but still it's high knowlegde people. All of them are of course my friends today, and I love to train with them. We are training with and without weapons, but the techniuqes are are based on the same movements. So it really doesn't mather. I am still in the learning process and love to learn new stuff, but I am also trying to mix it with all the other stuff that I've learned.